how to properly install roof racks! Ever since the very fist set of roof racks started being used publically, popularly has grown exponentially. From professional sport enthusiasts using them for their equipment, to weekend warriors loading their kayaks and bicycles. You’ll see nearly every type of vehicle with a set of roof racks on them, from a Subaru Outback to Mazda Miata (miraculously). Briefly in this guide we’re going to cover the importance of using a car roof rack and why any other way is harmful to your vehicle. Your roof at one point will collapse when too much weight is put directly on it. Not only that, but that rather fragile roof can dent and cave in easily when too much pressure is placed on, making a BIG repair bill. When you use roof racks for cars, you’re placing key pressure not directly on the center of the roof but instead on the frame of the vehicle. Essentially, the parts which help to keep the cars roof from collapsing on itself when flipped upside down. Using a good set of roof racks will prove to be beneficial, because you’re capable of placing a set of skis, bikes, kayaks, snowboards, big cargo box, or even a cargo rack. A good quality set of roof racks costs a pretty penny, but in the end, they will last you a long time and can be interchangeable from vehicle to vehicle with little to no hassle. Below, we’ll cover car roof racks and car bike racks that will leave you satisfied from the moment you make your first trip. Coming in at number 5 of our best car and truck roof racks to buy, is SportRack SR1002 Complete Roof Rack System. Made entirely of steel and coated in a black plastic to prevent rust and harsh UV rays. This is a universal fit, and will most likely fit practically any vehicle (with the exception with some convertibles). Installation is pretty straightforward, with little to no crazy components to put together. To check appropriate fitment for your vehicle, view their Fit Guide in product details. For each SportRack system, it includes load bars, rack feet, support brackets, mounting hardware, locks and keys. The included rack brackets can be fitted in three different positions, depending on the shape of the rails, and are designed with special compression knobs for installation free of tools. Max capacity for this system is about 130 lbs (or 60 kg). This is the least costliest route to take for a decent pair of car roof racks. From over 85 user reviews, this set of racks receives a 4.0 of 5.0 stars. 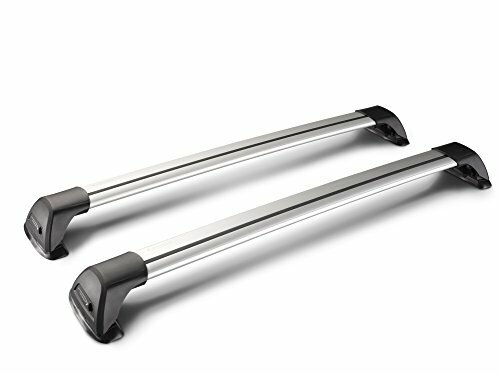 If your vehicle already has rails preinstalled on the roof, then Rage Powersports Aluminum Locking Roof Cargo Bars are perfect. You can increase vehicle cargo space by converting existing roof side rails into a cross-bar style cargo rack. This means mounting multiple bikes, placing a kayak, canoe, or even a cargo container without harming your vehicle’s roof. Also, with the large adjustable clamps and lock, you can deter theft. In terms of fitment, you can fit rails up to 50″ inches apart from one side and the other. Each bar features 5/8″ wide ribbed rubber inserts which provide additional grip (no more sliding around), along with all aluminum construction giving these set of racks a weight capacity of 150 lbs or 85 kg’s. Reasonable in cost, Rage Powersports Aluminum Racks are perfect for anyone who already has side rails. From over 160 user reviews, these car racks receive an excellent 4.5 of 5.0 stars. Check vehicle fitment and take a look at Rage Powersports! Stepping it up to some premium branded roof racks, Thule’s AeroBlade Edge Flush Mount Roof Racks are stylish and aerodynamic. Thule solves a big problem that most roof racks have and that is drag. In some cases, roof racks can reduce your vehicle fuel efficiency due to their resistance against wind. With Thule’s AeroBlades, this is solved by giving them a “airplane wing” styling. A set of these car roof racks work on existing sliding rails which most SUV’s and some cars already have factory installed. If your vehicle doesn’t have a sliding rail, you can get their additional brackets which work with non-rail roofs (a bit of a drawback considering the cost already). Thule isn’t a cheap brand, and longevity is a big determining factor for them. The AeroBlades not only improve fuel efficiency, but also reduce noise while driving. This model receives excellent feedback from its users, getting a 4.8 of 5.0 stars from 16 user reviews. **When you decide to purchase this set of car racks from Amazon, be sure to select the appropriate size for your vehicle. 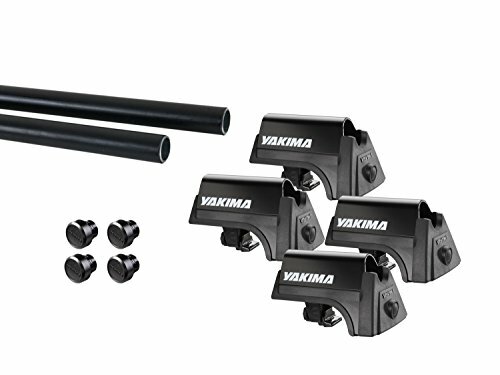 To complete a roof rack system, look no further than Yakima’s RailGrab Kit. This is where a basic look but effective functionality takes the win. With this kit, you’ll be receiving 2 58″ bars along with 4 towers which mount directly into a rail system (assuming a vehicle already has one). They are relatively thin and low profile, making them not stick out so much compared to similar models from different brands. Use this kit with either raised or flush-mounted factory side rails to have the perfect fit. Weighing in at just under 17 lbs, they won’t bog your vehicle’s roof down by any means. Use this to mount bikes, kayaks, cargo containers, or whatever your heart desires. From over 70 user reviews, they receive a solid 4.7 of 5.0 stars. Highly recommended for anyone looking for a simple to use, not too expensive set racks. 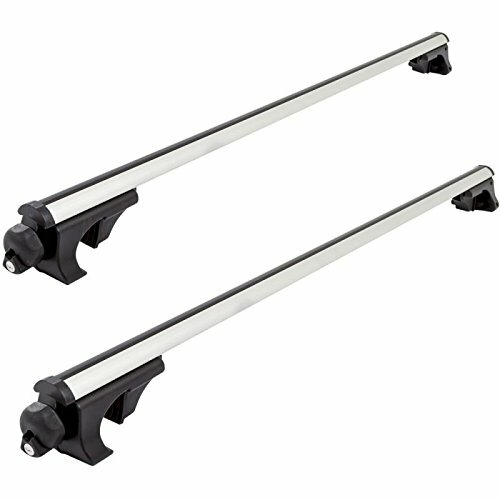 By far our most favorite roof rack system for cars trucks and suv’s, is the Yakima Whispbar Flush Roof-Rack System. Identical to Thule’s roof rack system above in terms of aerodynamics, but just a bit better. This model is fits on vehicles that are fitted with vehicle specific SmartFoot fitting kits. What we love about this rack system is the sleek design and look once properly installed. Due to the “airplane wing” like design, drag is drastically reduced, wind noise is reduced, and even some fuel economy can be improved. As you’d expect from a premium brand, you’ll pay a premium price. However, from over 50 individual user reviews it receives a solid 4.6 of 5.0 stars. Highly recommend this on ANY type of vehicle, because it won’t look out of place at all. **Some additional guides you may find useful is our trunk bike rack mount. If you want something more simple and more cost effective for just your bikes, a trunk rack is the way to go.